El Paso, Texas is home to Fort Bliss, which includes more than a million acres of land across Texas and New Mexico. The Fort Bliss Training center is part of the largest Department of Defense “controlled airspace” in the world according to the official site. Fort Bliss, El Paso boasts more than 50 training areas, 58 live-fire ranges, nearly two thousand tank trails, and a variety of training missions. Find information about Fort Bliss including the main commercial and DSN numbers for the base, information on basic services, base transportation, lodging for TDY and PSCing personnel, and inprocessing. 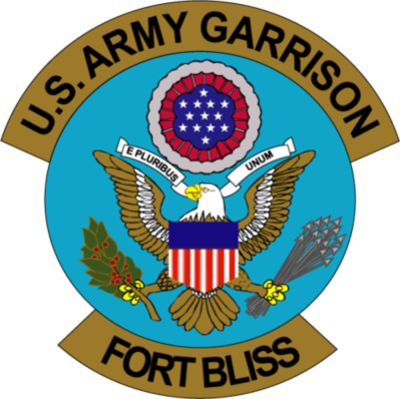 Fort Bliss is the largest Army installation in United States Army Forces Command, also known as FORSCOM. It’s second in size Army-wide only to White Sands Missile Range and is known for artillery testing, missile firing, and the 1st Armored Division calls Fort Bliss home after relocating back to the United States from a 40 year presence in Germany. Fort Bliss is also the location of the El Paso Intelligence Center, which is a federally operated tactical intelligence center. The installation got its’ start in 1848. Named after LTC William Bliss (the son-in-law of President Zachary Taylor), the first troops stationed there belonged to the 3rd Infantry Regiment. At the time the installation was known only as “the post opposite El Paso) until 1854 when it was re-named Fort Bliss. It was home to the 15th Cavalry Brigade during the Mexican Revolution, and during World War Two the installation’s mission included anti-aircraft battalion training (including the use of target drones) and later served as a POW / internment camp for Japanese, German, and Italian Americans who were at the time thought to be potential threats to the war effort. After World War Two, a group of rocket scientists came to Fort Bliss to work on V-2 test launches, and there was also development work on something known as the Hermes B2 ramjet but that was later cancelled. With the Cold War’s emphasis on missile defense, Fort Bliss became more and more important. The installation was responsible for training thousands of soldiers in anti-aircraft operations, air defense, and related areas. In 1957, the Army Air Defense Center opened at the installation, which included operations such as Army Air Defense School, 6th Artillery Group, and 61st Ordnance Group. In the 1980s, the installation was the place troops attending Army Ranger School would receive desert warfare training. There was some back-and-forth with Ranger School desert training operations; the facility would be transferred to a Utah facility for a few years before returning to Fort Bliss until the Army Ranger Desert training portion was discontinued in the mid 1990s. That was also the era Fort Bliss became the home of the Army’s Patriot Missile program. Patriot missiles played a vital role in the Gulf War and Operation Desert Storm. After the 9/11 attacks, Fort Bliss, El Paso was an important deployment center and served as a training base for Afghanistan security forces. In 2005, the Base Realignment and Closure Commission (BRAC) recommended the installation be used as a training base for heavy armor units and that decision resulted in more than 10 thousand troops from the 1st Armored Division being transferred from Germany to the El Paso installation. BRAC also recommended transferring other missions out of Fort Bliss including the Air Defense Artillery School and the Patriot Missile program. El Paso, Texas is a border town, and there are plenty of multi-cultural attractions, historic sites, and major sports centers to explore. Hueco Tanks is a historic site featuring ancient cave paintings, rock climbing, and self-guided tours of the area. Camping and hiking opportunities in El Paso abound including Franklin Mountains State Park. The Plaza Theatre is an important historical live venue in El Paso, and the area features several military-themed museums including the Fort Bliss and Old Ironsides museums. College football enthusiasts will love the e University of Texas at El Paso stadium known as The Sun Bowl, home to the UTEP Miners of Conference USA. As the stadium’s name implies this stadium hosts the December college football contest, The Sun Bowl. All new arrivals will need to visit the Welcome Center/Personnel Processing Center at Bldg 505 on Pershing Road. This facility is open 24 hours a day but in-processing procedures are conducted starting at 8:45 during normal duty days. Those who are reporting for duty at the William Beaumont Army Medical Center, or as students / permanent party for the United States Army Sergeants Major Academy will also report Welcome Center Bldg 505 on Pershing Rd. Fort Bliss, El Paso is served by the William Beaumont Army Medical Center, the Soldier Family Medical Clinic, Bliss Soldier Family Care Center, and the Hugo V. Mendoza Clinic. The Beaumont Army Medical Center features the U.S. Army’s first residential treatment facility for substance and alcohol abuse; it also runs a regional trauma unit. Services include preventive medicine, mental health, and pharmacy operations. There is also a full-service VA hospital located nearby. Fort Bliss child care services are operated by Child Development Centers on the main post, plus Logan Heights and East Bliss. Child care is available for full day, half day and hourly needs; there are before and after school programs for kindergarten through sixth-grade plus preschool programs. School age children are also eligible for weekly care; those in the first grade or higher can be enrolled in before/after school programs plus school break periods including summer vacation. There is also a Family Child Care option, defined as in-home care offered by adult care providers who reside on-post. For further assistance all personnel may also contact the Fort Bliss Personal Property Shipping Office at 915-568-4339. Those who need to renew, replace, or get new military ID cards, Common Access Cards, dependent ID, or retiree IDs are directed to make an appointment using the RAPIDS system. Fort Bliss does permit walk-ins and emergency requests that have not been scheduled using RAPIDS, but there are prolonged waiting times for these unscheduled services. Contact the Fort Bliss School Liaison office for assistance with local school issues at 915-569-5064. Permanent party military members reporting to Fort bliss must check in with the Housing Services Office (HSO). This must be done before any off-post permanent housing is arranged, otherwise military leave time may be charged for the entire house hunting period. The Fort Bliss HSO can assist new arrivals with temporary lodging as well as permanent rental or purchase options. Fort Bliss Family Homes manages the installation’s privatized housing; there are more than 4,000 housing units in nineteen neighborhoods open to all ranks. Those PCSing or coming to Fort Bliss TDY are authorized to use the Lodging Office Intercontinental Hotels Group (IHG)-Army Hotel. It is required to stay at the Fort Bliss IHG if there are rooms available, otherwise military members must get a Certificate of Non-Availability to file with their travel voucher to be reimbursed for off-base temporary lodging elsewhere. IHG is the central check-in location for all temporary lodging needs. Make reservations at 565-7777. The Fort Bliss Welcome Center van offers shuttles to the installation from El Paso International Airport and El Paso public transportation service includes bus routes run in and out of Fort Bliss. Local taxi service can also be hired for traveling on and off post. New arrivals to Fort Bliss are directed to register privately owned vehicles at the Vehicle Registration Office at Building 503, located next to the installation Welcome Center. A current license, proof of insurance, and proof of a vehicle inspection are required. Vehicles are required to stop at the entry gates and a 100% ID check may be required depending on security levels and other concerns. Texas state law requires all drivers carry minimum car insurance and all vehicles entering and exiting the base are subject to possible random searches or inspections. The Texas Department of Public Safety has a facility on the installation to help military members and their families obtain Texas driver’s licenses and more. Make an appointment or get more information at (915) 568-8631.